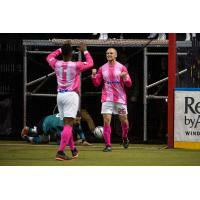 KANSAS CITY - The Kansas City Comets' win streak against their cross-state rivals from St Louis was snapped at eight games tonight as the Ambush got two goals from JerJer Gibson on the way to a 7-6 win. Rookie Adam James scored his first career hat trick in front of the 4,114 fans at the Silverstein Eye Centers Arena to lead the Comets scorers. The evening started out with plenty of excitement. Goalkeeper Mark Saxby, who just signed with the Comets as an emergency backup earlier in the day, made his first career start. He was immediately put to the test as the Ambush came out the aggressors in the game. St Louis outshot the Comets 9-6 in the opening quarter. In the first two minutes Saxby had already made a few good saves, but an unfortunate bounce after one of his diving stops hit an Ambush forward and bounced back into the net. The Ambush would follow up with two more goals in the opening quarter to take a 3-0 lead. Then Corey Adamson opened up the lead to 4-0 when he scored five minutes into the second quarter. St Louis seemed to intensify their offensive attack following Adamson's score, but the Comets took that to their advantage. They found several quick counterattack opportunities, with two of them leading to James' first two goals of the night. Kiel Williams knocked in a header goal to end the half, but the Comets still found themselves down 5-3 at the half. Neither team could find any foothold in the third quarter. Much of the play occurred in the middle third of the field. Late in the period, St Louis' player/coach Hewerton snuck behind the Comets defense after a substitution and found himself alone with the ball against Saxby. He was able to score the only goal of the period to double up the Comets score at 6-3 heading into the final quarter. Kansas City has a history of comebacks this season, with all three of their wins against St Louis this season coming from behind. Heading into the fourth quarter it was obvious the team felt they could do it again. In the sixth minute Nacho Flores hit a rocket from distance that the Ambush goalkeeper never had a shot at. Guerrero Pino added another from distance before James closed out his hat trick in the tenth minute of the period. Unfortunately, St Louis' Gibson scored his second of the game midway through the period. His goal ended up being the game winner after Kansas City could not find the net in a final flurry of action at the end of the match. After eight straight wins against the Ambush, the Comets dropped this result by the score of 7-6. The Comets will be right back at home in the Silverstein Eye Centers Arena next Saturday, February 17th for a special Matinee Game. Kickoff is at 1:05pm as the Harrisburg Heat come to town for their second match of the season. Tickets are available for the match here. The Kansas City Comets have a long rich history of indoor soccer in KC, including the 2014 MISL Championship. For tickets and information call 888.9.COMETS (888.926.6387).